I read this article and found it very interesting, thought it might be something for you. The article is called Cinema: Free Solo and is located at https://www.totallydublin.ie/film/cinema-reviews/cinema-free-solo/. It’s rare that a documentary on sport (albeit a very extreme one) examines the subject of life and death so intimately. In Free Solo, the tale of singular climber Alex Honnold, death is a support character that appears throughout, alongside his girlfriend, mother, friends and film-crew. So is El Capitan, the sheer 3000ft rock-face in the Yosemite National Park that Honnold will attempt to scale without any safety equipment. There’s no nets, no harnesses, nobody there to catch him. Its stark beauty has a hypnotic effect on the protagonist in a way that no person is able to. Should he fail in his quest to conquer, Honnold seems content that this is the last face he will gaze upon. The balletic grace and atomic precision of the free-soloists well-honed limbs, alongside a small bag of chalk for grip, are the only necessities to make the ascent. They are his safety net, his buffer between experiencing life as he dreams it and the inevitability of it being all over should they fractionally fail. Human endeavour has long been a source of fascination. ‘Firsts’ of anything are bound to draw attention. This one is different though, maybe because it’s devoid of any machinery or engineering beyond the finely tuned human anatomy. Who better to capture this, and captivate us, than the pre-eminent documentarians of life on Earth – National Geographic? They seem to feel the consequences, yet understand its significance, more acutely than anyone else. 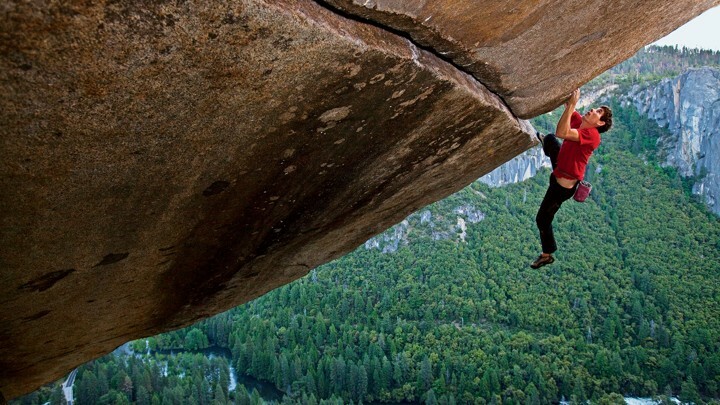 Their breathtaking and intimate shots, risky in their own right, place us in the shoes and psyche of Honnold. They, alongside climber, allow us to see and feel things we never thought possible. We, the audience, weren’t actually there, but for the duration of the film we were. Right next to Alex – freedom only a foothold away.